Chris Davis has done it, it being a thing he definitely didn’t want to do. 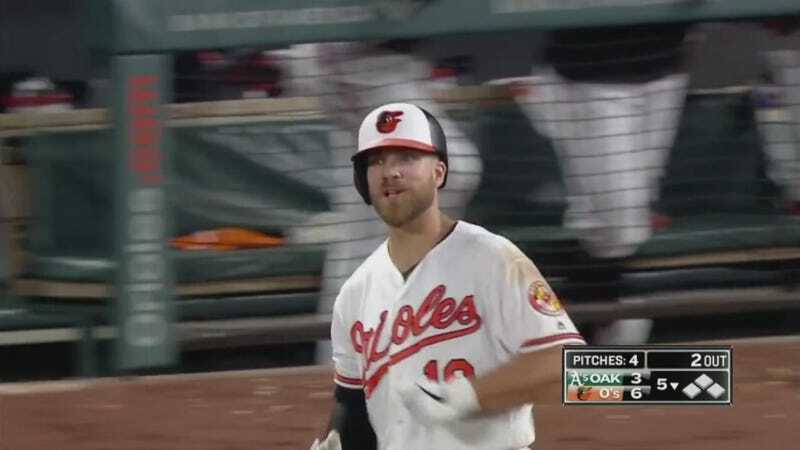 The Baltimore Orioles’ slugger—uh, hitter—uh, statue—lined out to left in the bottom of the fifth in tonight’s game against the Oakland Athletics. In doing so, he reached an 0-for-47 mark which began Sept. 14 of last season, and has broken the record for the longest hitless streak in history set by Eugenio Velez over the 2010 and 2011 seasons. The record-breaking at-bat had the briefest glimmer of hope, in that Davis made contact with the ball, but A’s outfielder Robbie Grossman easily tracked it down. Davis’s teammate Cedric Mullins, who came into this game batting .091 and is hitting ninth, has two triples tonight. Davis is already working on building his lead: In his 48th at-bat, he struck out looking after four pitches. His next goal will be to reach, or avoid, Tony Bernazard’s record of 57 plate appearances without a hit, set in 1984*. What an extremely depressing feat! Update (10:19 p.m. ET): Davis struck out swinging in bottom of the eighth, a five-run inning for his team, and has extended his hitless streak to 0-for-49. He was the only Orioles player to not get on base at least once tonight. Mercifully for him, the game’s over. Baltimore won, 12-4. Correction: Tony Bernazard’s streak of plate appearances without a hit was in 1984, not 1974.